Lieutenant Daniel Hyer started his career as a fire fighter at the Noble Fire Department, serving there for 5 years. 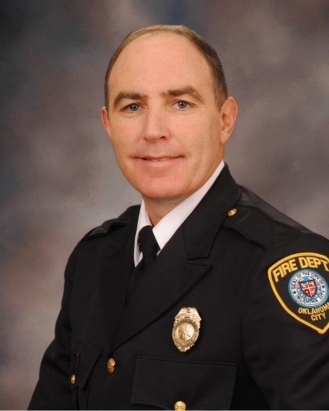 He had been employed with the Oklahoma City Fire Department for the past 15 years. He had served as a fire fighter and paramedic. For the past two years, he had been working at the departments EMS Training Center. He loved the work he did, and was known by many as having a "servant’s heart". Dan was a loving and dedicated father and husband. He had a real love for the outdoors. He was referred to by some as "Cowboy Dan" or "Hunter Dan". He enjoyed fishing, hiking and his annual hunting trips in southeastern Oklahoma. It was there he met his wife, with whom he shared many adventures. Dan enjoyed spending time with his friends and family. He loved music, playing the guitar and dancing with his wife. Dan was a spiritually minded person and made his faith a real priority in his life. Dan will be remembered by many as a man of great character, who had a kind and gentle soul. He will be greatly missed by his friends and family.